Oil the grate (grill) and heat on med-high. When the grill is nice and hot, grill each half of the peach for 4-5 minutes per side. Set the peaches on a plate with cut side facing up. 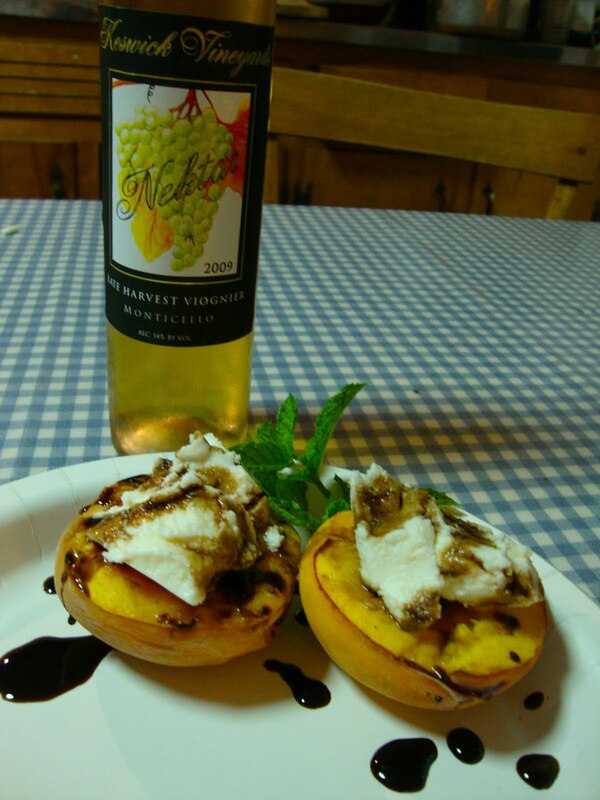 Place a dollop of fresh ricotta in the center of each peach half and drizzle with the balsamic reduction. Cook the vinegar/brown sugar mixture down on med-high heat until it is reduced by half, approximately 3 minutes. No need to explain further! If using bay scallops, keep them whole. If using sea scallops, cut each one in half horizontally. Sprinkle with salt and pepper, toss with flour, and shake off the excess. In a large saute pan, heat 2 tablespoons of the butter over high heat until sizzling and add the shrimp and scallops in one layer. Lower the heat to medium and allow the scallops to brown lightly on one side without moving them, then turn and brown lightly on the other side. This should take 3 to 4 minutes. Melt the rest of the butter in the pan with the scallops, then add the shallots, garlic, and parsley and sauté for 2 more minutes, tossing the seasonings with the shrimp and scallops. Add the wine and cook for 1 minute. 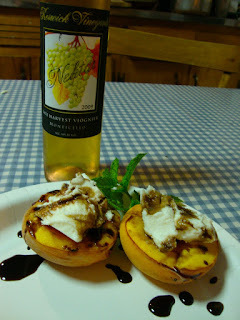 Another simple, yet delicious appetizer, made by Michelle and myself. Take a few layers of phyllo dough and spray with cooking spray. Spoon brie into the middle of the dough and gather all edges into a bundle. Bake for 20 minutes. Allow to sit about 5-10 minutes before serving. Wow! I didn't like mushrooms... until I tried this appetizer! It is loaded with flavor and so easy to make. Combine the crabmeat, cream cheese, parsley, green onions and Parmesan. Season with Old Bay. Stuff the mushroom caps with the mixture and top with bread crumbs. Spray the tops with nonstick spray to help them brown. Transfer to the oven and bake for about 20 minutes, or until the filling is hot and melted. BLT (Bacon, Linguine, Tomato) all made in one pot! Makes for easy clean up! I originally found this recipe on Williams-Sonoma's page. It won the "Easy Weeknight Meal" contest and I can definitely see why! I modified the recipe a little, so my version is below. Here is the original. Slice the bacon cross wise into strips. Cook in a large pot on medium heat for 8-9 minutes, or until crisp. (Your house will smell wonderful.) Remove bacon and drain on paper towels. Drain pot, leaving 1 tbsp of bacon grease in the bottom. Place broth and diced tomatoes into the pot. Increase heat to high and add onion, red pepper flakes, and garlic. Sauté for 2-3 minutes or until tender. Once almost at a boil, add pasta and half of the cooked bacon. Simmer uncovered for 9-10 minutes or until pasta is almost cooked by still firm. Stir occasionally. Remove pot from heat and add cubed neufchatel cheese, grape tomatoes and basil, reserving 1 tbsp of basil for garnish. Cover and let stand for 5 minutes or until pasta is tender and sauce is thickened. Serve with remaining bacon, grated Parmesan cheese and reserved basil. This makes about 6 servings, but I will caution you- your guests may go back for seconds! Enjoy! This recipe is one of Emily's that we made together. While eating, we also thought of other items that would be good in addition to or as substitutions: Mangoes, Red onion, Strawberries. In large bowl, combine cooked couscous, pepper, dried fruit, cilantro and green onion. In small bowl combine dressing, lime peel, and hot sauce. Stir half the dressing into the couscous mixture, Cover and chill couscous mixture and remaining dressing for 1 to 4 hours. To serve, combine salad greens and almonds in a large bowl. Pour remaining dressing over greens, toss to coat. Divide greens onto plates and spoon couscous mixture on top. Mix all ingredients (except the Sprite); freeze overnight. Fill glass ¾ full and add Sprite.